Perfect for you to relax, rejuvenate, enjoy a little sport and stroll along the boardwalk. Come and experience the renaissance of a legendary seaside resort... Welcome to Trouville! A magical renovation project, overseen by Monuments Historiques and the expertise of the MGallery and Thalassa Sea & Spa from the Accorhotels group, has given Cures Marines a new lease of life in the style of palaces from the beginning of last century. 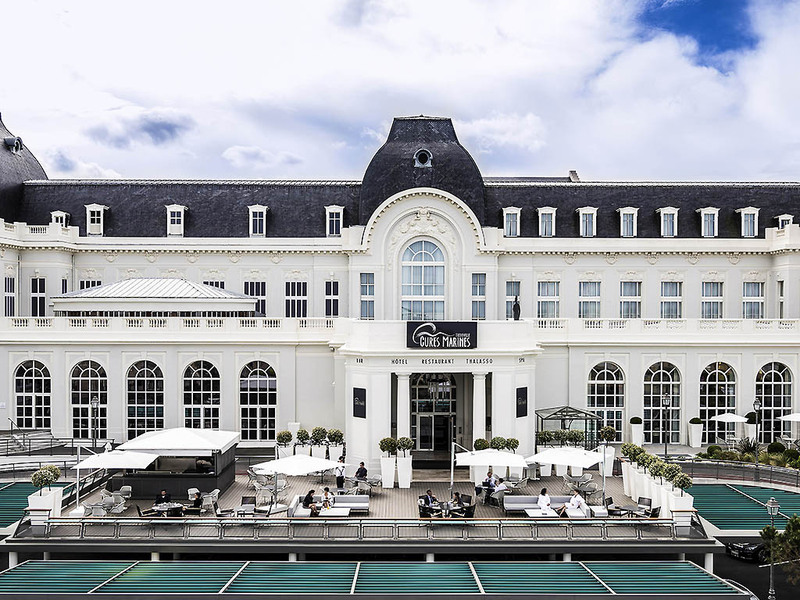 Th e Cures Marines 5-star hotel is nestled in the right wing of the Casino in the heart of Trouville, not far from Deauville. Inspired by the first seawater baths, the Cures Marines Institute revives visitors with a desire for well-being and pleasure. The 103 rooms including 7 suites are decorated with frescoes composed of decor found at the site and positioned above the beds, pearly chandeliers that bring the 1970s to mind, shades of white and gray highlighted by blue, and make Precious materials such as wool, waxed linen, mat and satin adorn the windows, sofas and chairs. The curtains can be drawn completely around the room to create a cozy cocoon away from the noise in an intimate acoustic. Reine des Plages Suite, 1 king size bed, sea view. Gourmet cuisine inspired by the riches of the sea and regional products from Normandy is offered to you in a majestic room with a view of the "Reine des Plages" and the sea. Balanced cuisine that creatively combines fresh, local produce. Authentic and delicious food served each and every day. Dine at this dependable brasserie, which regularly updates its menu to guarantee freshness, quality and taste. A relaxing and friendly space, the hotel bar offers a rich and varied menu. Its unique location gives you an unmatched view of the Trouville beach, the promenade and the sea. I loved the open plan room. The porter was very helpful and pleasant. The dinner was superb. Some constructive criticism would be to check the waitresses uniform it let the service down as she did not look professional. Also the sofa near the bar needs to be recovered! The throw was shabby and again let down the overall experience. Would love to return someday and will recommend to friends. Merci! Great stay please make difference a bit easier for people staying wanting to loose weight by identifying calories number with each meals. Evening room service a bit too quick and simple for a 5 star! Réception wouldn’t take my Accor platinum number !! Nice enough but not the usual standard. Nice clean room but the outside corridor had a strong smell of cooking. Also it was not pleasant accessing the Spa area through the restaurant. Very professional and attentive staff. Great Spa facilities. Restaurant food was excellent. Excellent service from staff in a lovely building that is nicely appointed, with great views! Superb food in Le 1912 restaurant. Much appreciated Platinum benefits! We had 3 nights in semi-pension. Meals at night were very appreciated and good. We had treatments during 3 days also of a good quality. All people (personnel) are extremely helpful and kind. The hotel looks great on the web site, but it's better than it looks. The service was excellent, the room was lovely, the restaurant excellent. Beautiful hotel with sumptuous surroundings and wonderful breakfast buffet. Enjoyed the pampering of the bed linens, with nightly turn down and chocolates, plus the towels and robes for the spa. Breakfast was a highlight with a full and varied spread of delicacies. The salt water pool was a little disappointing as one side was reserved for classes/programs, and the other was full of small children. The sauna and hammam were nice! A beautiful hotel near "les Planches" the Trouville boardwalk. Buffet breakfast is stunning and plentiful.Turn down service with chocolates at night. Pool was rather crowded as it was school holidays but the plush robes and slippers to go down to the spa area are lovely. Sauna and Hamman available. Really liked the shampoo and conditioner, even bought some to take home. Generally we had a pleasant stay and there are only small issues to address critically. Those are: (i) we missed a hand basin in the toilet room, (ii) the capacity of the breakfast room was not sufficient and one morning the hotel ran out of bread at 10 a.m. (we had breakfast without bread!) and (iii) the sauna and wellness section needs much more cleaning attention. The location of this hotel is fantastic. The building, decor and, certainly our room, are all beautiful. The service via the internet and by telephone prior to our stay was excellent. I spoke mainly with Titania who answered all my questions and requests promptly, efficiently and with courtesy. Service on arrival was good. Valet parking, escorted to our room, all good. Milk in our room which had been requested was provided. We ate the first night in Ephemer, which was not good. The greeting at the restaurant was not existent, the food was mediocre, the prices high and the service was terrible. It needs a strong manager to ensure that standards are raised to what one would expect in the brasserie of a 5 star hotel. Dinner second night in 1912. Food generally good, service a bit quick but generally good. Our breakfast experience was haphazard. No welcome at the entrance - a question of find your own table. Tables not laid consistently eg sometimes cups and saucers, sometimes not. Sometimes a spoon, sometimes not. Sometimes we were asked about hot drinks, sometimes not. The ‘hot’ breakfast selection (one morning no bacon) was good, but only just lukewarm. The buffet selection - juices, fruit, croissants, cake, jams, etc. etc. was fantastic and beautifully presented. Excellent. We had drinks and food in the bar on several occasions. The staff there are dry good. Helpful, efficient, very pleasant. Reception and concierge staff were also good, although on one occasion a request I made to reception for some cups in our room was forgotten and we had to ask again. Housekeeping was very timely, and generally good, although our bathroom products were not replenished eg bath foam at all during our four night stay. So, generally a good stay, which with some tweaking, could have been a great stay. Amazing people at the Spa (Christel and Céline) and a very friendly, efficient and helpful concierge Hervé!!! Amazing people at the Spa (Christel and Céline) and a very friendly, efficient and helpful concierge Hervé!!! Breakfast wasn't spectacular. rooms ok, but bathroom to small for two people. staff was really friendly. reception wasn't that efficient. My experience was below all my expectations, in every possible way. We had booked 2 rooms for a spa weekend for my friend's birthday. We arrived and I asked at the reception which was the room for the birthday girl (I already noted the birthday when making the reservation and when checking in online). The receptionist had to fiddle around with the computer to find it, he then gave the key to the birthday girl, wishing her happy birthday. Not too bad, I thought, only to find out he gave her the wrong key! It was my room that had the bottle of cider, not hers. We changed rooms and realized the bottle of cider wasn't even for my friend--there was a card for M. et Mme Couratier congratulating them for their wedding anniversary??!! My friend's name is Polina and, again, I had written it down twice--once when I made the reservation directly with your hotel and again during the online checkin. When we mentioned this to the receptionist, he didn't even apologise, let alone fix the mistake. Not only this, but the receptionist didn't even have a single spa brochure in English. Two of my friends don't speak French and it is unacceptable for what claims to be a 5-star hotel to not have information about the spa in English. Are my two friends the only non-French speaking guests of your hotel? The rooms themselves are not well maintained--there are chips and spots on the walls, there is rust on the curtains, on the bed sheets and on the towels. I had to ask for floor towels and soap since there weren't any after the room was cleaned. The spa itself isn't well maintained either--there was paint missing, humidity stains on the walls and dirt on the tile floors. But the worst part was the breakfast. It took forever to order and get coffee, and, on the second day, my friend had to return the coffee 2 times because it was burnt. She finally got a filter coffee instead, the whole ordeal took about an hour. Items available earlier (such as fresh figs, cheese or red beans) were not replaced as they ran out, so every day we had to go to breakfast earlier and earlier if we wanted to have those items. And then there was the omlette station where the Algerian omlette maker always tried to speak Russian to us. We are Bulgarian, not Russian, as we told him several times but this didn't stop him. It got to the point where another hotel guest who was patiently waiting for her omlette behind us also had to tell him we were not Russian and there was no point to demonstrate his Russian skills with us. As a result of this completely insensitive behaviour, getting our omlettes took about 20 minutes each day. And at every breakfast he tried to speak Russian with us. Is there no cultural training for the hotel's staff?? All in all, I will not be returning to your hotel and will certainly not be recommending it to anyone. The lack of service is staggering.